How are the benefits of investing in the active lime production line? Faced with the increasingly serious environmental problems, the state vigorously promote sustainable development and energy saving and environmental protection road, vigorously strengthen the support of new environmental protection cause. This initiative, to many of the more serious pollution of the heavy industry brings opportunities and challenges. The traditional lime rotary kiln equipment to the production environment caused great pollution, and the cost is great, is not conducive to the development of the environment. In order to deal with the crisis caused by environmental pollution, the Chaeng(Great Wall machinery) from the crisis break through tight encirclement. 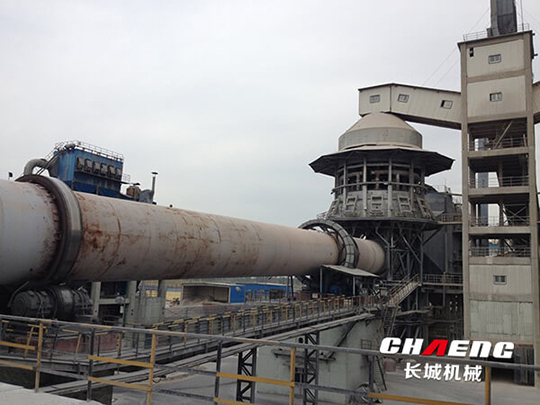 Chaeng has more than 50 years experience in the production of large-scale rotary kiln, in order to keep up with international pace, improve product technology and competitiveness level, the Great Wall Machinery launched an upgraded version of lime rotary kiln, won the majority of customers. At the same time gradually the development of general contracting services, to undertake Nissan 200-1500 tons of active lime line of "turnkey project" services. The qualified limestone (20-50mm) is lifted by the hoist and transported to the top silo of the preheater. The top silo of the preheater is controlled by the upper and lower two level meters, and then the limestone is uniformly distributed to the preheater room through the discharge pipe. Limestone in the preheater by 1150 ℃ kiln flue gas heated to 900 ℃ or so, about 30% decomposition. The hydraulic push rod into the rotary kiln, the limestone in the rotary kiln calcined into CaO and carbon dioxide. The decomposed limestone enters the cooler, and the cooled air blown in the cooler is cooled to 100 ° C or less. The heat exchange of 600 ℃ hot air into the kiln and gas mixture combustion. The exhaust gas is cooled by a multi-pipe cooler, then enters the bag filter through the draft fan, and enters the chimney by the exhaust fan. The lime of the cooler is fed into the lime product warehouse via vibrating feeder, chain bucket conveyor, bucket elevator and belt conveyor. Active lime is an important auxiliary raw material for steelmaking. The use of active lime has a series of features such as improving the quality of molten steel, increasing production, reducing steel consumption and cost, and stabilizing operation. Where the use of active lime steel-making enterprises have achieved significant economic benefits.